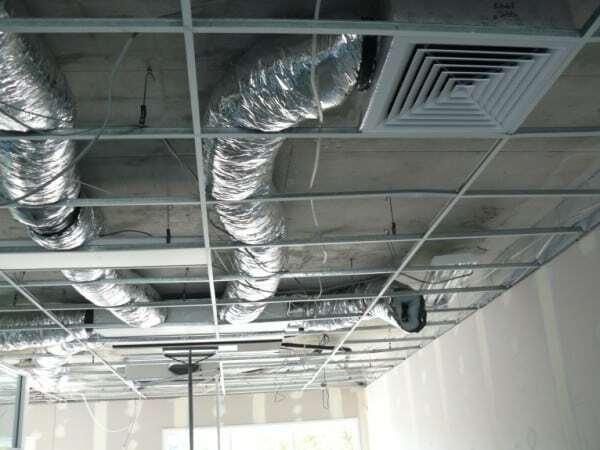 Modern construction methods and suspended T-bar ceilings leave little room for ducted air conditioning systems. However they can be installed using slimline ducted systems. There are a number of manufacturers that supply slimline ducted systems e.g. Mitsubishi Electric, Daikin. In the example below the building is multi-level and the floor above is concrete. The t-bar ceiling is suspended from the concrete. The distance between the concrete and the ceiling is 270mm. A slimline ducted (Mitsubishi Electric) indoor unit (250mm) is bolted to the underneath of the floor (next level) above the office space The layout of the ducts must be such that there is no crossover of the ducts (due the limited ceiling space). To achieve this the indoor unit should be centralised in the space and the supply air plenum custom built to match the design. Most air conditioning component suppliers can custom make supply air and return air plenums. Ensure that mechanical dampers are fitted to the supply air spigots so that the air to each area of the office can be balanced. The office size is approx.100 sqm and ceiling height 2400mm. 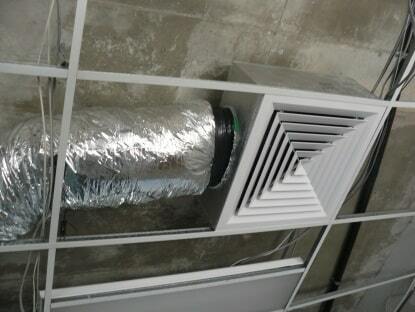 A 14kw capacity ducted system is used. 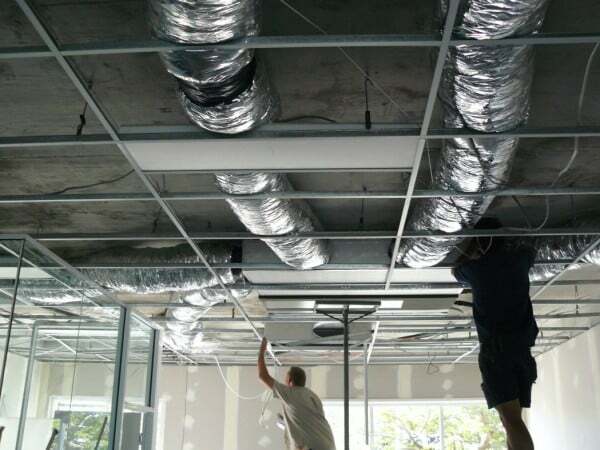 This design and installation results in a well-balanced heating and cooling office system. Get in touch with Crown Power today for all your air conditioning needs.